Configurable Options and Product Addons are two features of the WHMCS shopping cart which provide customisability during the initial sign-up process and throughout the product's life-cycle. In this blog post we'll look at how they give you - as a business owner - flexibility to offer more complex product offerings, ones with options and choices that allow users to purchase additional items and configure products and services. Configurable Options and Product Addons are similar in that they allow clients to customise their orders, but there are some distinct differences that determine which is the best to use in a given situation. Automated provisioning is required with a provisioning module. Next I'll discuss Configurable Options and Product Addons is more detail. Configurable Options enable you to provide multiple choice options for a product or service which can be used to determine the final price. As a service provider it allows you to provide additional items and customisation options for the services you offer using a single product. Empower clients to customise their service, for example by choosing the quotas on a hosting plan or adding extra hard drives to a dedicated server. WHMCS makes this easy as the options only need to be created once. Configurable options are managed in groups, meaning that the same configuration opportunities can be offered across multiple products - no need to create the same options multiple times for each product! Save time by offering customizable services without the need for a sales agent to manually create custom quotes for each visitor. Research has shown that dropdown menus are ideally suited to convey more than 7 options or when a user can easily predict what options will be available. This could be incremental values such as tick rates on a gaming server, country lists, or disk space quotas where specific increments are required eg. 25GB, 50GB, 100GB. It's also a good choice if the default value is the preferred selection, without encouraging too much scrutiny of the other options. Radio options show a list of all available choices, so are best used when there are fewer than 5 to select. They're also good when you want the visitor to review all the options and make a clear comparison. For example; selecting a backup option for a hosting account with three choices; None, Local and Remote. A familiar checkbox which can be ticked to indicate acceptance or addition of a service, the cost of the option is added to the shopping cart if the box is ticked. For example adding a SMS Notification service or Server Management service which have a single recurring price. The quantity configurable option adds a Number Field to the order form, allowing visitors to specify a numeric integer. This value is then multiplied by the specified unit price, and added to the shopping cart total. This is great for virtual resources where clients can specify any value they like; such as the number of listeners on a Shoutcast station, or Inodes on shared hosting. Sliders add a visual element to the ordering process. Visitors use their mouse to select a quantity between a specified minimum and maximum value. This is then multiplied by the unit price and added to the shopping cart total. Great for quantity items where there is an upper limit, such as disk space or bandwidth; allowing users to interactively set their own quotas and see the total adjust in real-time can increase engagement with the ordering process. Configurable options can be mixed and matched as required; use a Slider to pick the disk space quota and a radio option to choose between backup options. Selecting the appropriate option type for the job will help visitors complete the configuration process with ease. 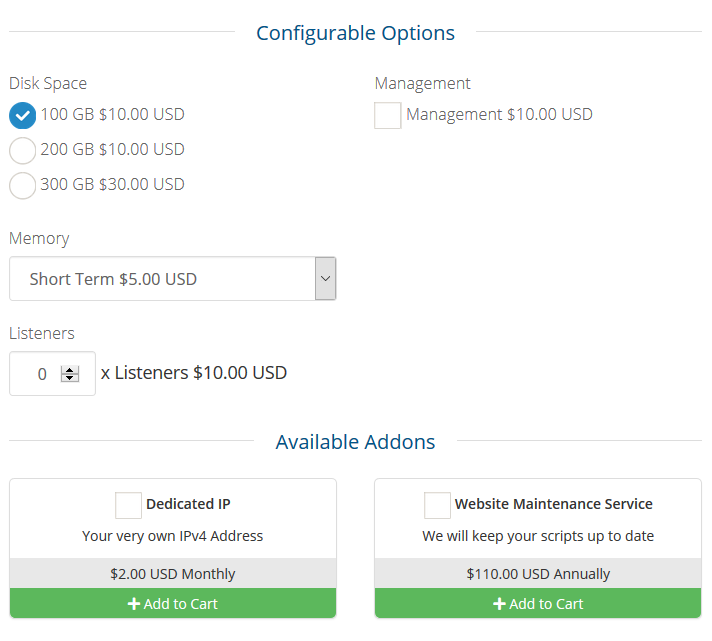 WHMCS then calculates the total based upon the base product price, plus the price you've specified when creating the configurable options. Clients are invoiced automatically based upon their selection on the order form. The benefits don't end there; configurable options can also be upgraded/downgraded via the client area. Enable clients to scale up/down their service at any time - all the while being invoiced or credited the appropriate amount - freeing up staff from providing quotes or adjust pricing manually! Product Addons let you offer additional items during the order process for a given product, the client can add it to their order and be billed separately from the main product. These can be additional products such as SSL Certificates or value added services such as Website Builders or Backup Services. Product Addons can also be assigned a module, meaning multiple services can be provisioned automatically when a client orders a single product with one or more addons. Why limit the upsell opportunities to just the initial order? WHMCS empowers users to order product addons at any time via their client area, and when connected to a provisioning module, the deployment is fully automated. Once you've decided which is best for the scenario, login to the WHMCS Admin Area and navigate to Setup > Products/Services , and choose either the Configurable Options or Product Addons page. If you have used configurable options or product addons in a novel or particular effective way, I invite you to share them in the comments below.